This article was originally written by Sierra Tuthill and appeared on TCU360.com on November 4, 2015. It has been republished with the author’s permission. The TCU Riff Ram chant is one of the oldest traditions in TCU athletics. Band director Claude Sammis, who first organized the university’s band in 1925, started the chant in 1926 and it is now chanted at every home football game in Amon G. Carter Stadium. There was a slight change at the most recent TCU vs. UT game. As the crowd prepared to chant, a Riff Ram rap blared through the stadium and the crowd went wild. Them T.C.U. 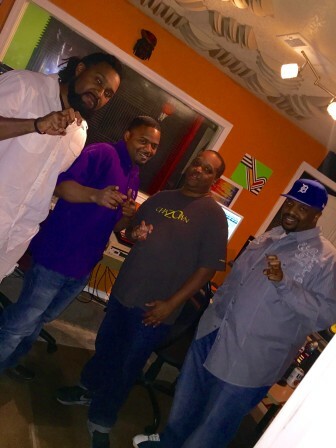 Boys at Global 1 Entertainment recording some new music. “Them T.C.U. Boys” made their vision a reality. The group of four men met at TCU in 2000. All four men came from musical backgrounds and started freestyling at parties. Daniel Earl, a member of Them T.C.U. Boys, got the idea for the song when he was at a restaurant with quarterback Trevone Boykin. At dinner, Boykin discussed how pumped he was for this season. Daniel Earl then called the other members of his musical group and shared his new idea. He had an old hip-hop beat playing in his head and revamped the Riff Ram chant into a rap song. After the group finalized and recorded the song, they shared their piece via email to TCU alumni. Eventually, TCU Athletics Director Chris Del Conte and Assistant Athletics Director for Marketing Drew Martin got a hold of the song. Martin said that it makes perfect sense for TCU to play the song at games as the Riff Ram tradition has continued to evolve and become an even stronger brand component of TCU. Them T.C.U. Boys said the next step is to create a music video. They said they want to include all of TCU Athletics and the entire Horned Frog Family. The song “Give Em’ Hell” (TCU Fight Anthem) can be found on SoundCloud and will soon be available for purchase on iTunes.